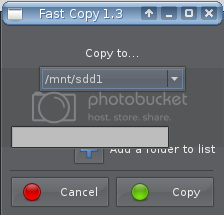 menu for copying a file to a USB stick. So I made an equivalent right click for Puppy but put more features in it. entire folder can be copied. It has been gettext'd for foreign translators. Note that in Puppy Linux, /mnt/home is where your frugal install is located. It works with Rox Filer or Thunar file manager. There is an incompatibility with pwidgets explained in next post. I never bothered to implement this. I use an invisible entry box to form the 'Add' button. is visible . The app can still be used. There is no .po or .pot file inside the .pet. How should one translate to different languages? Don, will it copy in the order the files are numbered? When I copy mp3 files to my mp3 player, I have to use rsync -a because simply dragging and dropping or using cp from the command line results in the files being transferred (copied) in some semi-random order. That causes a problem because every mp3 player I've tried so far ignores the file names and instead plays the files in the order they were loaded into the mp3 player. Somehow rsync -a forces the files to be loaded in numerical order, which is the way I want them to play. 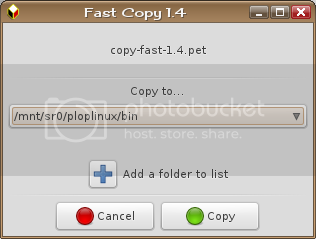 The GUI appears after doing a right-click onto a file and choosing copy to.... If I'm clicking then the "add a folder to list" button and am closing the file selector gui by its top right close button, the copy process begins to start without any warning, when the file is not already available. I did this accidentally after right clicking a directory (for testings) containing around 8 GB of files. Since the destination directory was /root/Downloads and the process could not be stopped I've had to watch the directory /root/Downloads and pressing ctrl-a from time to time to remove these files to avoid system crash while writing into empty RAM (have only 1.5 GB) - for some minutes! in numerical order, which is the way I want them to play. Have you tried the -p option when using cp command. permissions to do this), and the file permission bits. How should one translate to different languages? A mo file is automatically created at end of process. Poedit isn't needed unless you want fancier interface. Is this a problem with a too lively mouse?? Have you tried to deaden it with the mouse wizard?? I would have to use my LazY Precise for this. I think poedit will do the translation if the xgettext is installed. when a folder with same name is in the destination location. 4) pot file available for translators. File in and send back. I am getting the problem on a wary 5392 (my default online satellite machine). I shall test on the others later and update this, but this is what i was getting on all three. I have attached a image with a fake .gz for your perusal. UPDATED: Interesting, for my wary/racy pre 5.5 (5.4.90/3) and 5.5 without the service pack have problems, add the service pack, it's gone. I shall have to update my others as I do like your little package. Sorry for the trouble. If you could track down the source of the bug that would be useful. I don't think the version of gtkdialog makes any difference. Pwidgets does some monkeying around with the gtkdialog theme. What is the gtkdialog theme when the visibility bug occurs. Does the upgrade change this theme?? 1) Changed window placement to "2"
of the variable EXIT when relaunching program . I think that this is now fixed in version 1.7. Now unintended copying won't take place. Buttons are wider to accept foreign translations.